I've stated in previous posts how my skin has been looking a bit pore-y lately - especially between my brows. I've also noticed that since I've been fake-tanning, it's just making it all the more obvious. I'd gotten a pretty good makeup routine down to help combat the problem (a combination of Benefit's Porefessional Primer and Revlon's Photoready Perfecting Primer) but I wanted something a bit more long term. At first I picked up Soap & Glory's The Fab Pore Daily Micro Smoothing Moisture Lotion and I do find that to work but it's a slow process. 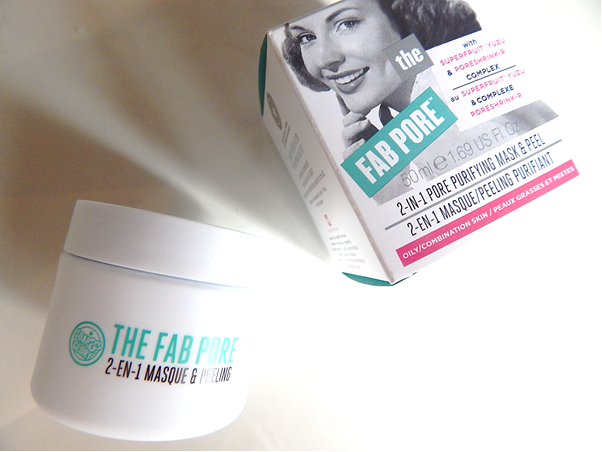 I'd heard good things about it's mask counterpart - The Fab Pore 2-in-1 Pore Purifying Mask & Peel (£10.00) and decided I'd give it a whirl. As far as first impressions go, you can paint me impressed. My pores were visibly smaller after the first use and my complexion feels 10x smoother. I'm looking forward to making this a weekly treatment and seeing if the difference remains.